The way people dress has always been a reflection of the times and, these days, fashion is no longer synonymous with only the young and nubile. A report by fashion website The Fashion Spot found that there were four times as many models over the age of 50 in Fall 2017 fashion shows in New York, London, Milan and Paris, compared with Spring 2016 shows. Chinese-Irish designer Simone Rocha made headlines when she used 72-year-old model Jan de Villeneuve recently in her London fashion week show. Labels such as Italian fashion house Dolce & Gabbana and American brand J.Crew also included older models in their runway shows this year. The term age-appropriate has gone out of fashion. These days, the only fashion faux pas, it seems, is a lack of confidence. At this year's Cannes Film Festival, 70-year-old American actress Susan Sarandon wore an emerald green gown with a thigh-high split and a plunging neckline. French First Lady Brigitte Trogneux, 64, is known for her skinny jeans; musician Sting, 65, is a fan of fitted suits; and actress Helen Mirren,71, is known for her ageless style. In Singapore, say industry watchers, the tide is also turning, fuelled by changing attitudes about ageing and an increasingly open-minded society. Associate Professor Xiao Hong from Nanyang Technological University's sociology division says: "People say 60 is the new 40. Now, the later years are seen as an extension of middle age rather than 'old age'." She adds that the growing ageing population here also means that the demographic has become a force too large to be ignored by fashion designers and retailers, who are increasingly catering to their needs. Lifestyles have also changed, says Lee Kong Chian Fellow and Associate Professor of psychology Norman Li, from Singapore Management University's School of Social Sciences. "Many retain their looks and health as they age. They are also working and playing for more years than before and want to continue to look good," he says, pointing to better healthcare and education on how to age well. 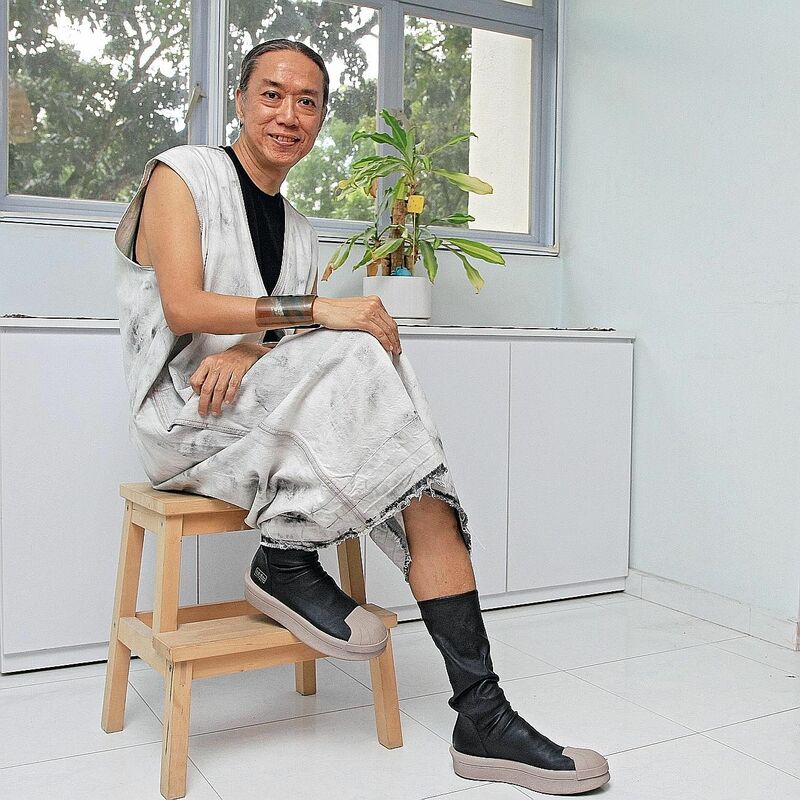 The bottom line, says Assistant Professor Galina Mihaleva from Nanyang Technological University's School of Art, Design and Media, is that growing older should not stop anyone from wearing what he wants to. A more inclusive society, she says, means the idea that older people have to dress a certain way no longer exists. Style is also not just about "dressing young", but about celebrating one's looks. After all, she says, "true style is timeless". The Straits Times speaks to four fashion-savvy Singaporeans in their 60s and 70s, who have not let age slow them down. Dressing well energises part-time sales administrator Mei Lam, 68. The mother of two children in their 30s, wears trendy outfits such as 1970s-inspired wide-legged pants, paired with a lace top with bell sleeves and white sandals with a chunky heel. I don't want to look like an auntie. I won't wear floral prints or animal patterns. The petite, soft-spoken woman, who took up Latin dance and ballroom dancing in her 50s and dances about thrice a week, wears figure- hugging dresses with low-cut backs and high slits when she dances. On whether people take notice of her clothes, she says: "I get lots of compliments from friends and passers-by." Though some might take stares negatively, she views them positively. "I have a lot of admirers," says Ms Lam, who buys clothes from fast- fashion label Zara, multi-label store StyleLoft3 in Mandarin Gallery and smaller boutiques at Far East Plaza. Her confidence may stem from the belief that there is no shame in ageing. "I am not shy about telling people my age. I'm frank. There's nothing wrong with growing old." But she does not intentionally dress younger. Rather, she wears what makes her happy. "I don't want to look like an auntie. I won't wear floral prints or animal patterns," she says of her style, a mix of 1970s mod and bohemian silhouettes, and contemporary structure with some feminine fabric. Dressing up gives her energy. "I never want to think I shouldn't dress this way just because I'm getting older. "Staying fashionable gives me energy and it's fun." 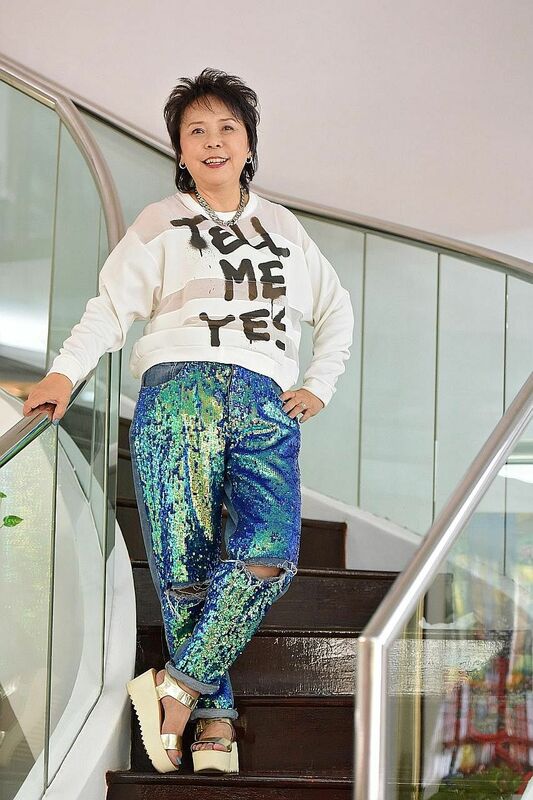 Creative director Esther Tay, 62, goes through her friends' wardrobes to help them put together fashionable outfits. The founder of a company that makes and designs corporate uniforms says that several of her friends have wardrobes three times as large as hers, but do not know how to match their clothes. "I help them choose colours that will best suit their skin tone and help them shop for versatile pieces and shoes that will work with most outfits," she says, adding that her eye for fashion was honed after years of working in the fashion industry. The mother of three children, aged 30, 27 and 24, loves wearing pants paired with a top and a jacket, but her outfits always go beyond the simple matching pantsuit. She selects street-style jumpers and jackets with a grunge vibe for a less corporate look. "My dressing reflects my personality. For me, it is important to present yourself through your clothes. How you package yourself speaks volumes," she says. Her style is a combination of office chic and polished streetwear and there are some things she will not wear. "I won't wear polyester. Good fabric is very important. Natural fabrics such as cotton, linen and wool hang much better on the body and are more flattering." The businesswoman also stays away from anything too frilly or lacy. "It's just too girly and does not fit my personality." For her, staying fashionable has no age limit as long as one understands one's style. "Wear what is comfortable. When you look good, your self-confidence increases with your self-esteem - and you will value yourself more." Singaporean hairstylist Francisco Raquiza has not let age temper his eclectic style. The 61-year-old's wardrobe - with thigh-high leather boots, patchwork fitted vests, harem pants and jumpsuits - looks like it could belong to an experimenting teenager. But the bachelor, who describes his style as "easy", says he has always pushed boundaries when it comes to fashion and that age has never deterred him. "I've never liked dressing like everyone else. I like things that are eye-catching rather than normal." Even in his youth, he remembers choosing to wear velvet bell-bottoms and red leather boots, rather than the blue jeans and brown shoes worn by his peers. Why the unconventional style? He says that he does not want to be boring. "Everyone has his own preferences." Yet, dressing like Mr Raquiza takes a certain amount of daring, no matter what age one is. "My friends ask if people stare at me. But I don't even notice the looks," says Mr Raquiza, who lives alone in a three-room HDB flat in Ang Mo Kio. "I've been stared at since I was young, so I am immune to it." To those who stare, he poses this question: "Why can't I dress the way I feel?" The clothes he wears make him happy, he says. Some go-to pieces at the moment include long structural tops, wide black shorts and oversized round sunglasses. He likes labels such as American brand Rick Owens, British label Vivienne Westwood and fast-fashion brands Cotton On and Topman. "I buy things only on sale though. Never full price," he says. Retiree Jessie Chng, 70, has such a timeless style that her 41-year-old daughter and 18-year-old nieces often borrow her clothes and accessories. "My nieces - they are triplets - live on the next street, so they often come over to borrow my things. Their friends compliment them when they wear my clothes too," she says. Showing off her clothes, she pulls out a new pastel-pink jacket from fast-fashion label Zara. "I showed it to one of my nieces and she asked if she could borrow it straightaway." The former merchandise manager is an avid shopper and frequents the malls in Orchard Road. "I will cover the whole Orchard Road stretch. I can't stay still and malls are like my playground," says the energetic septuagenarian with a funky, laid-back style. Her clothes are not too colourful, but she makes her outfits pop with bold accessories. She also loves to travel and often plans overseas family shopping trips. "We love going to Guangzhou to shop. They make everything there." She does not believe that being 70 means having to dress a certain way. "I want to be edgy. Just because I'm 70 doesn't mean I have to dress like a 70-year-old. I want to be trendy and fashion-forward. I'm a recycled teenager." At the end of the day, she says, it is up to the individual to decide what works. "Why not wear what you want? How many more years do I have to go since I'm already 70? I better wear all that I want while I can. I might drop dead tomorrow. "I don't agree that older folk have to be more conservative. I don't want to be stifled. Everywhere I go, I want people to turn and say 'wow'."